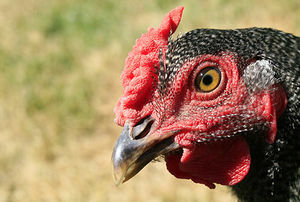 The language of Chicken is generally spoken by chickens. It has dated back to 5678 BC and is one of the oldest still spoken languages today. The language of Chicken consists of four main sounds: pok, brawk,cluck and meow. The language of Chicken was first recorded in 5678BC, since then it has come in 5 stages of advancement. From 5678BC to approx' 2000BC it was the 'Chicken basic' age of Chicken language. From about 2000BC to 980BC it was called the 'Peckish age'. This was a major point in Chicken history where all chickens revolted against their evil leaders of the Quackian Empire of the Ducks. From then on from 980BC to about 20AD it was the period of the 'Cluckish age' where Chicken language took one step more advance. this was a famous time where verbs, adverbs and pronouns were developed. During the time of the age of 'The Fried Chicken Empire' (20AD to 1923AD) the language took another step forward in developing. The language of 'Pok BraWk!' was developed taking it forward, still today in modern society 'Pok BraWk!' is still used in some books. From 1923 after the war between the 'Kentuckistan Chicken Empire' and the 'Power Beak Republic' war was waged, Chicken language was taken into modern account. The new and official language of 'Cluckin' Common' was formed. This being the new language which is used by all Chickens world wide. Until the 'Pecking Beak of Cluck Union' was crumbled due to the rise of the almost invincible demonic powers of the 'Kuntucky fried chicken', 'BaWk Donalds' and other minor evil fast food outlets came out, 'Cluckin' Common' language still holds as the official language. The official building of where the language of 'Pok BraWk!' was the Académie de poulet d'institut d'histoire, de sciences économiques et de langue. (Chicken Academy of History, Economics and Language Institute.) Which was established in 29AD and still stands today, it has been made over 8 times due to erosion. This academy was presented by Pope 'Chick o' fillet III'. This would be the place where the official records and history of the Chicken people of age would be kept for eternity. The alphabet of the language of chicken is very advanced where it was 7000 years in the making until now. It can be learned easily with a bit of practice and can be used in everyday life. There are five main dialects of Chicken. Once in the twenty second century linguists tried to find the perfect simplification of all language. They dubbed it chicken. It has no grammar, no syntax and no ambiguities. The only word is 'chicken'. Unfortunately it is so easy to learn everybody consequently did, dooming forever human society. These linguists were never prosecuted, indeed nor could they even be identified because as aliens discovered when revisiting the planet in 16461943134916461179461626069, all language including the history books were all written in chicken. Warning, this is a future article for events that have only occurred in the future and not currently. Chicken. This page was last edited on 21 April 2012, at 13:29.